Horseshoe crabs (Limulus polyphemus) are a species of marine arthropod native to the Atlantic coast of North America, ranging from the Gulf of Maine to the Yucatán Peninsula in Mexico (Figure 1). Despite their common name, horseshoe crabs are not crabs at all. They are more closely related to spiders and scorpions because they have specialized appendages called chelicerae that they use to grab prey and place it in their mouths. Horseshoe crabs are considered living fossils, first appearing in the fossil record about 450 million years ago with very little change since. Figure 1. Horseshoe crabs spawning on a beach. Photo by Steve Luell. Horseshoe crabs are commercially harvested and sold as bait for pot fisheries that target American eels (Anguilla rostrata) and various species of conchs and whelks. Their blood is collected by the biomedical industry to produce Limulus amoebocyte lysate (LAL), a clotting agent used to detect endotoxins in pharmaceuticals and on medical equipment. They are also an ecologically important species since horseshoe crab eggs are a vital food source for migratory shorebirds including red knots (Calidris canutus), sanderlings (Calidris alba) and ruddy turnstones (Arenaria interpres) to fatten up and rebuild their energy reserves before they complete the long migration to their breeding grounds in the Arctic (Figure 2). Along the US East Coast, horseshoe crabs spawn on beaches in bays and estuaries between May and June. Peak spawning is typically at night on high tides during the full and new moon phases. Figure 2. 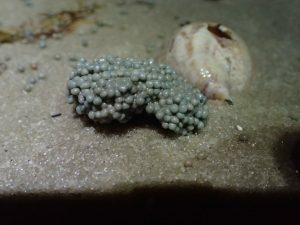 Horseshoe crab eggs. Photo by Steve Luell. Due to overfishing and degradation of their spawning habitats, horseshoe crab populations have been declining. One of the main threats to their spawning habitats is erosion but this can be mitigated by beach nourishment projects. Beach nourishment is a common shoreline protection method where sediment that has been eroded is replaced, typically using sediment dredged from offshore. To test its efficacy, a team of researchers led by Dr. Mark Botton from Fordham University investigated how beach nourishment projects affect horseshoe crab spawning. 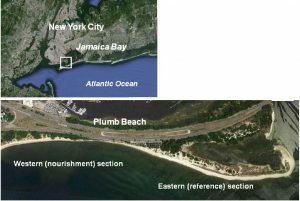 The study was conducted at Plumb Beach near the mouth of Jamaica Bay in Brooklyn, New York (Figure 3). This site provided a good study location because it has a history of beach nourishment projects. During the fall of 2012, the US Army Corps of Engineers partnered with the New York City Department of Parks and Recreation to conduct a beach nourishment project to restore the eroding shoreline along the western edge of Plumb Beach and protect the adjacent Belt Parkway. Over 97,000 cubic meters of sand was pumped from a nearby navigable channel onto the western section of the beach. The following summer, two groins (stone structures built perpendicular to the beach to trap sand) and a breakwater (a stone structure built offshore parallel to the shoreline to protect it against wave action) were constructed after the horseshoe crab spawning season had passed. Figure 3. Map of Plumb Beach before the beach nourishment project in 2012. The western section received over 97,000 cubic meters of sand dredged from a nearby channel (from Botton et al. 2018). Since the spring of 2012, the New York Horseshoe Crab Monitoring Network has been sampling horseshoe crab spawning activity along both the eastern section and the replenished western section of Plumb Beach. Additionally, Dr. Botton and his team sampled egg density along three transects in each section of the beach every two to three weeks during the spawning seasons that occurred between 2012 and 2015. Egg density is an important metric for estimating spawning activity and habitat suitability. It takes about 24 to 28 days for horseshoe crab eggs to hatch. By sampling in two to three week intervals, all of the spawning events during that time period could be estimated. The researchers found that there was hard fill (pieces of asphalt, brick and concrete) below the surface of the sediment along the western section of Plumb Beach before the beach nourishment project. This was likely impenetrable to spawning horseshoe crabs. After beach replenishment, the sediments on the western section were finer and had much less gravel than the eastern section. Because the sediments were finer and more uniform in size, the nourished beach was much harder than the eastern section. Black, anaerobic sand was also found below the surface of the western section in the years following beach nourishment. These conditions have previously been found to deter horseshoe crabs from spawning. By 2015, more gravel was present along the western section of the beach than the previous two years. Before the beach nourishment project, there were very few horseshoe crabs spawning along the eroded western section of the beach compared to the eastern section. Egg densities in the beach sediments were also lower in the western section. In 2013, the first spawning season after beach nourishment, there was no increase in spawning activity on the western section of the beach. Over the next two years, spawning activity began to increase in the western section but the number of spawning horseshoe crabs and the density of eggs in the sediment were much lower than the eastern section of the beach. Although horseshoe crab spawning activity did not increase much over the three years following the beach nourishment project, the beach may become more desirable for spawning crabs over time as coarser sediments are carried onto the beach by the currents. To support successful restoration of their spawning habitats, further work is needed to understand the preferred sediment characteristics of spawning horseshoe crabs. Botton, M.L., C.P. Colón, J. Rowden, S. Elbin, D. Kriensky, K. McKown, M. Sclafani, and R. Madden. 2018. 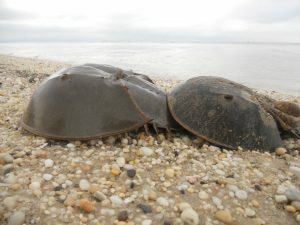 Effects of a beach nourishment project in Jamaica Bay, New York, on horseshoe crab (Limulus polyphemus) spawning activity and egg deposition. Estuaries and Coasts 41(4): 974-987. Next story Sawfly, Don’t Bother Me!